All teachers have had those students that just don’t seem to like reading. Whether it be not reading at grade level, minimal exposure to books at home, or just a plain fear of reading, these students dread the words, “OK, it’s time for reading.” What can you do to help your reluctant readers overcome this hatred of reading? We hope you can use our top 5 tips that have helped our students love reading. Students must be allowed to have some time during the week to read what interests them. Whether it be a picture book, a car magazine, or even a comic book, allowing students some choice shows them that reading can be fun and enjoyable. We use The Daily Five in our classroom, and once a week we allow students to bring in the above-mentioned reading materials for one of our rotations. The students look forward to these times to read their “brain-break” books. We also have our classroom libraries organized into categories to make it easier for students to find books that interest them. Categories such as: natural disasters, sports heroes, and animal stories, are incorporated with the more traditional groups such as: fantasy, realistic fiction, and biography to name a few. 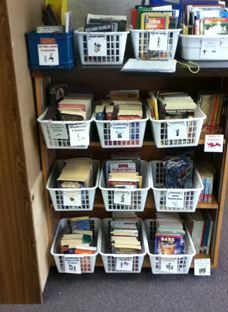 The books are in bins which make them more visible and more accessible to the students. See below for a picture from our classroom and a way to get our book bin labels as well by clicking on the book bin labels example. To inspire those reluctant readers to read outside of school, we created monthly reading logs. Students are given a reading log at the beginning of each month and set a goal. We usually tell the students that they should average about 20 minutes a night. After they set a goal, they take the log home and keep track of their minutes each night. A parent/guardian then signs the log and it is brought back to school. If the student meets his/her goal we do a fun celebration called Pop a Top. Each student that reads on average 20 minutes a night, is able to bring in a drink of their choice. We count down 3-2-1 and then open the cans and bottles at the same time to make a cool noise. We have awards made up too that states the person’s name, the month, and the number of minutes read. They like receiving the easy to make awards. Also, sometimes we allow students to bring in comic books, picture books, or other fun books to read on this day. Many of you may wonder what about those students whose parents do not sign logs? We specifically send books home with those students and tell them to use the honor system with their minutes. Then we meet with them at school, discuss the books they read, and sign off on their logs. If you click on the links you can access some of our reading logs to purchase if you’d like. March: Read Around America. April: Take Me Out to the Ball Game. and May: The Reading Rocket. A big part of our reading instruction is teaching the reading strategies to the students. We do have a curriculum in place, but oftentimes the curriculum isn’t exciting or relevant to our students. So as a supplement to what we teach, we often do fun activities as well that still get the students thinking and talking about what they’ve read. One activity that is fun is having the students create a name for a band, a play list of three songs, and design a CD cover based on a chapter read in a book. They love to do this, and it is amazing to see their creativity. We have also used sticky notes for students to use in their books to mark: words they don’t know, questions that they have, predictions that they make, and other reading strategies. We actually have sticky notes on our class supply list at the beginning of the year for parents. Students love being able to mark up their books without actually writing in them! Another fun activity is having the students create apps on an iPod word document that we created. Students make the apps based on the book that they read. It is fun to see their creativity come out and their explanation of why they chose the apps that they did. Connecting with the author and characters in the book is fun through a text messaging activity that we use. Students are able to use “text talk” to communicate with cell phones based on the author and characters in the book. We also use social networking to have students create a page based on a character in a story that they’ve read. They enjoy the creative part of this project, and it is fun to see who they add as friends and the comments that are left on their pages. You can access these fun activities by clicking on the pictures. We love to do read alouds in our classrooms. During these read alouds, we often do fun activities such as: turning off the lights during a part of the story that takes place at night, lighting a candle with the lights off and sitting in a circle, allowing the students to draw and color a picture related to the story, having the students read a page to the class, and using think-pair-share. But probably our favorite activity is doing a 1/2 day or whole day celebration of the book that we read aloud to the class. For example, one of our favorite books to read aloud is Holes by Louis Sachar. We do a Whole Day of Holes and the students love it! Our class becomes Camp Green Lake with water canteens, yellow spotted lizards, and even a treasure hunt to boot. Click on the below picture to find out in more detail what we do on this special day. We have found that celebrating books that we have read out loud gets reluctant readers excited. They are more apt to try another book by that same author or a similar book from that genre. Every day we hold guided reading groups where students are reading a book picked by the teacher. This is important to practice the reading strategies and to help students continue to improve their reading comprehension and fluency. We also like to celebrate at least once a month by giving our students. It is a “day off” from guided reading groups. We call this day Daily 5 Choice Day. Instead of just being able to do two choices, they now have three choices to pick from. It is amazing how many reluctant readers pick an additional read to self choice! They love having that extra time to read what they want! Read Across America Day is obviously a big day in our classroom. We have students bring in Dr. Seuss books to read. We also do a few fun read alouds from his books. It is also important to do reading related activities throughout the day. We hope that the above ideas can help get your reluctant readers more excited about reading! Please share any ideas that you have used in your classrooms too! How do I get my students to master their multiplication facts? If this is a question you have often asked yourself, we will give you 5 great ideas that will help your students be successful in your classroom. At the beginning of each year we do a multiplication inventory with our fifth grade class, and every year there are close to half the students that can not pass the inventory in the time allotted. This always makes us scratch our heads, because we know that multiplication is essential in doing division which is a major focus of 5th grade. There is no way around it. The students have to practice, practice, practice. It is like riding a bike or learning how to swim. It is very difficult and scary to begin, there are falls and panicky times along the way, but once the skill is learned it becomes second nature. Whether it be flash cards, a computer game, or any other method, time has to be spent reviewing the facts. Instead of giving up, and moving on with our curriculum, we have developed many ideas and activities to help those students that have not yet mastered their facts. We hope you enjoy the top 5 tips that we use to help our students master the multiplication facts. I’m sure many of you have seen the 9s trick before. It is an amazingly simple trick that all the student needs is his hands. Take a look at the picture below. The fifth finger is down which represents 5 x 9. 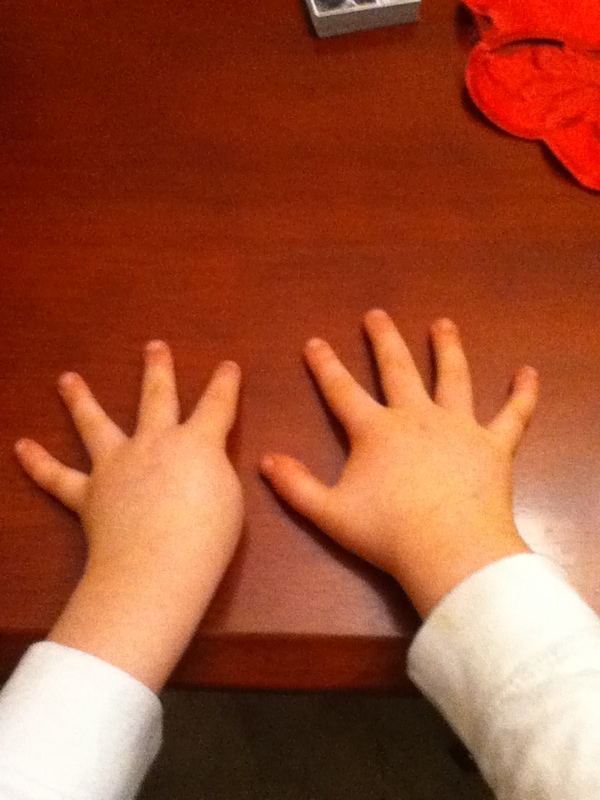 Take a look at the fingers before (4) and the fingers after (5). There is your answer 45! Try another one yourself. Put your 7th finger down. There should be 6 fingers before and three fingers after (63)! this works all the way up to 9 x 9! Nines will no longer be a problem for your students! Another strategy we use with struggling students is repeated addition. This is a simple way to reinforce that multiplication is related to addition, a skill that all of them should have. Start off small with a problem like 2 + 2 + 2 = 6 which is the same as 2 x 3 = 6. If you get to a bigger problem such as 6 x 4, have them use the number that they can count easier with. So the problem would look like 4 + 4 + 4 + 4 + 4 + 4 = 24. When you are able to relate multiplication to addition it is a familiar concept that students are more comfortable with. We also teach students to look for and understand patterns. When multiplying two even numbers together you will always get an even answer. When multiplying two odd number together, you will always get an odd answer. We also go over the 5s, that when multiplying by this number the answer will always end in a 5 or 0. When multiplying any number by two it simply doubles the bigger number. There are many other patterns out there to discover as well. Here is a FREE sheet that we have the students keep in their math folders to reference as well. Who doesn’t love to play games? I know my students love it when I announce we are going to play a game in math. One that I love to use is Multiplication War. This is like the regular War card game. Each players gets half the deck. But instead of the high card taking the cards when flipped up, the students have to multiply the two cards together! If there is a tie, then they put two cards down and flip the third up. The winner then gets all the cards. When we start playing this, I take out all the face cards. Each card represents it’s number and Aces = 1. I try to match students up based on the knowledge of their facts which makes the games more competitive. The students can either play until someone has all the cards, or for a time limit as well. We have also developed Multiplication Game Boards that are designed for any of the facts. So if a pair of students is struggling on their 4s, they can play the game board together. If you have students that are doing well, you can give them the mixed envelope that has facts of 6s,7s, and 8s. Once again, we team students up based on ability so it is more enjoyable for the students. It’s also a great way for them to see which facts of each number they still need to practice. Click on the below picture to access the game boards. We don’t go to the computer lab that often, but we have found a few online games that are suitable and fun for our students. Here is a favorite website with lots of games to choose from: http://www.multiplication.com/games Our students also like this one as well: http://www.fun4thebrain.com/mult.html. It is a great break for the students and makes learning the facts fun as well! Many of my students are in to rap music. Making up a multiplication rap is a fun way for students to remember the facts. I even tried my talents at this with the 6s,7s, and 8s (the most troublesome for my students) as you can see below by clicking on the picture to access the FREE rap. If you can find a rhyme to use to help students learn the facts, I would definitely try it. Maybe even let them explore their creativity and make up their own! After so many years of seeing students struggle, we developed some contests to try and inspire our classes to learn their facts. So often teachers put up a board in the room with everyone’s names and Xs by the facts that they pass. We have found that does not help the lowers students, but rather has the opposite effect. Students tend to give up, and even act out in class due to others teasing them or saying they are dumb. When they pass all of the facts in one minute, they move onto 30 seconds. This is a great challenge to the advanced learners as well. This motivational program got our kids excited to do speed races without being graded or singled out for where they are. We also have used a Multiplication Money Contest with our students in different years. We know that not all students learn the same, so we came up with a unique contest that involves fake money that students earn and can use to purchase items in our class store. There are also rewards when the whole class passes each number. They really loved doing special class celebrations together to celebrate their achievements! Tying real-life experiences to multiplication also helps the students understand why it is important to master the facts. We often use places that the students have gone to, and will go to in the future as examples. A great place to start is the grocery store. We talk about needing to buy 3 dozen eggs (3 x 12), two packs of gum with each pack having 6 ( 2 x 6), four twelve packs of soda (12 x 4) and so on. The students start to realize the importance. Then we start talking about electronics! This is where they sit up more in their chairs and the doodling stops. We talk about items that matter to them such as: iTunes, mp3, and video games. An example would be: John (insert name of student) wanted to buy three albums (insert popular bands) on iTunes that each cost $8, how much would he have to spend? It is amazing to see how students will work harder to figure out this type of problem. We have also used the topic of buying comic books or looking at collections (sports cards, stuffed animals…) and using multiplication for different scenarios as well. Making connections to their lives truly does make a difference. 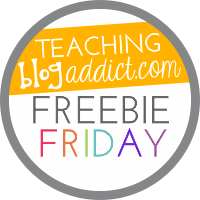 We hope you were able to take at least one idea from our post to use in your classroom. If you have any great ideas, please share them as well! 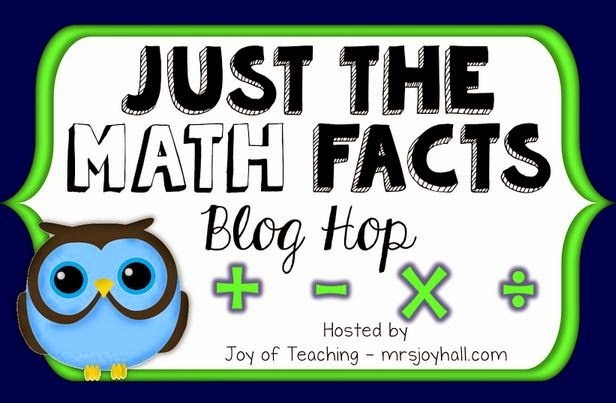 Make sure to stop by the next hop spot that is about Cool Tools for Addition and Subtraction Fact Mastery next!